← Take a page from the pros…. Disasters are a time when we come together to support each other as human beings. Plain and simple. It’s not about politics. It’s not about religion. It’s about people. Saving lives. Food. Medical care. Clean water. A place to sleep. Everyone is getting involved. President Obama has allocated $100 million via USAID. 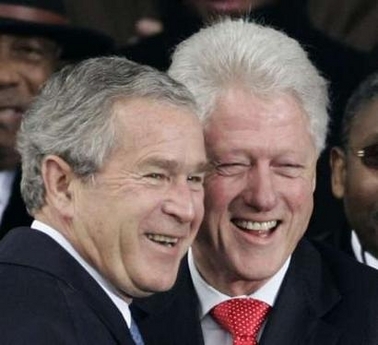 Former Presidents Bill Clinton and George Bush are busy fundraising. And so are many others. Disasters are also a time when Americans give generously as a country and as individuals, families, and local communities. We give and we fundraise. We also need to be paying attention to how we give, who we give to, and how we fundraise. Here are some links you can check out for more information. Advice on Giving to Haiti Support – guidance from the Better Business Bureau regarding how to make your gift to support Haiti. Text and Give – how to give via text messaging. Includes a list of 21 different organizations you can give to via a text message. $16 million have been given via text messages as we write this blog! Updates on Giving to Haiti – stay up-to-date with information about giving and fundraising for Haiti. Information provided by the Association of Fundraising Professionals. That’s it for now. And as always, remember to have a FUNdraising Good Time! You can make a difference. This entry was posted in People, Uncategorized and tagged charitable giving, fundraising, philanthropy. Bookmark the permalink.